Apple's iMessage app appears to be down for some users, with a number of people noting on Twitter that the service is experiencing issues. Sending a message results in an error, with future messages sent as standard text messages. According to Apple's system status page, the service experienced outages that affected 30% of iMessage users from 3:35 to 4:11 EST, but the app still does not appear to be functioning as normal. 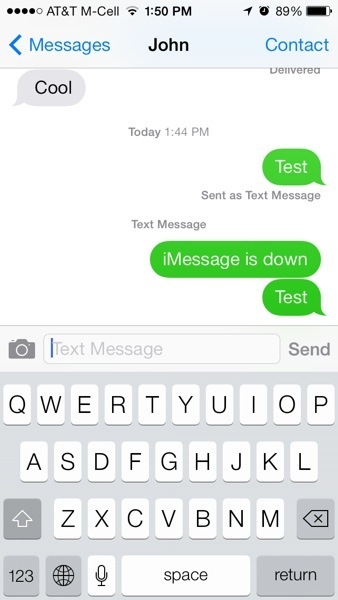 iMessage has suffered from several outages in the past, with the most recent major outage taking place in April. Just tried resetting the network settings and that did work!!! "Can anyone tell me what MobileMe [iCloud] is supposed to do?" Having received a satisfactory answer, he continues, "So why the **** doesn't it do that?" I was down for 3-4 hours. Absolutely inacceptable level of service. are you sure this isn't some issue with your phone or connectivty?